There will no longer be growth promotion claims on drug products containing medically important antimicrobials (MIAs) (Category I, II and III antimicrobials; List A Active Pharmaceutical Ingredients), including in-feed medications, for use in food animals – labels for these products will only have treatment, prevention, and control claims. Labels of all drug products containing MIAs will include responsible use statements. How Does This Affect Availability of Medicated Feeds from Feed Mills? They cannot sell DIN drug premixes to animal owners for mixing on farm – only veterinarians and pharmacists will be able to sell these once a prescription is provided. All label claims for in-feed drugs containing MIAs approved for sale in Canada have been added to the CMIB as of April 2018. This will help feed mills to quickly provide standard medicated feeds when a prescription is provided. Medicated feed not listed in the CMIB (i.e. off-label) will be made to order by the mill once a veterinary prescription is received, which may have an effect on how quickly animal owners can obtain medicated feed. To help reduce the ongoing emergence of antimicrobial resistance, Health Canada is increasing the oversight of antimicrobial use in animals. An important component of this strategy is to move all MIAs to the PDL. These actions align with international best-practices and protect human and animal health, as well as food safety. Without veterinary oversight, animal owners may be less likely to follow good antimicrobial stewardship practices. Veterinarians, uniquely positioned as experts in animal health, have the experience, skills, and education to help ensure that antimicrobial use is justified and appropriate, as part of good antimicrobial stewardship. What Do These Changes Mean for Veterinarians? These changes might come as a surprise to some animal owners, so veterinarians will need to explain why these changes are occurring. As all MIAs will require prescriptions, veterinarians will need to ensure that they are knowledgeable about prescription practice standards. Developing relationships with local feed mills and animal nutritionists will help make the process of prescribing and dispensing in-feed antimicrobials as smooth as possible. 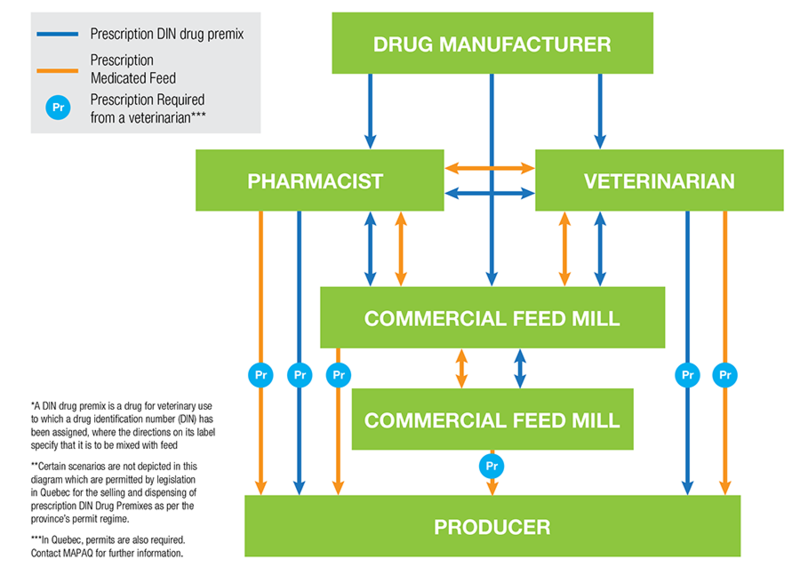 Veterinarians may see an increase in demand for services, as animal owners who had previously been able to obtain MIAs from commercial feed mills without prescriptions will need to establish a valid veterinary-client-patient relationship (VCPR) to obtain prescriptions for in-feed medications. The ability for feed mills to floor-stock on-label medicated mixed feeds is also important to consider, as it can have a significant effect on the speed with which clients can obtain medicated feed once their veterinarian writes the prescription. These changes could present a number of opportunities for veterinarians to shift client focus toward disease management tools other than in-feed antimicrobials, including improved biosecurity, nutrition, and vaccination strategies. How Does This Impact Your Clients? Animal owners who have not previously worked with veterinarians will need to establish a valid VCPR to obtain MIAs that were previously available without a prescription. Animal owners that had been using MIAs as growth promotants will no longer be able to do so. Enhanced veterinary involvement will encourage appropriate antimicrobial use, as well as an opportunity to work with veterinarians on other areas of management (e.g. biosecurity, vaccination, nutrition and feeding) that can help reduce the overall need for antimicrobials.